For several years I’ve experimented with “cognitive maps” of organizations. These are labels that would help me better describe what I saw and heard and understand the relationships among various bits of data. I started this endeavor when I realized that though I knew a lot of organization theory, most theories are either (1) too narrow to include everything I wished to understand, or (2) too broadly abstract to give much guidance. These notes represent a progress report on my efforts to combine bits of data, theories, research, and hunches into a working tool which anybody can use. For want of a more elegant name, I call this tool the “Six-Box Model.” This model (Fig. 1) has helped me to rapidly expand my diagnostic framework from interpersonal and group issues to the more complicated contexts in which organizations are managed. Figure 1 provides six labels under which one can sort much of the “funny stuff” that goes on in organizations, both formal and informal. These labels allow people to apply whatever theories they already know in doing a diagnosis and to discover new connections among apparently unrelated events. Visualize Fig. 1 as a radar screen. “Process” issues show up as blips in one or more boxes, blocking work on important tasks. Air controllers use radar to manage relationships among aircraft–height, speed, distance apart–and to avoid heavy weather. Similarly, a blip in any one box cannot be managed independently of its relationship to the other boxes. However, six potential starting places give you several alternatives when choosing an improvement strategy. 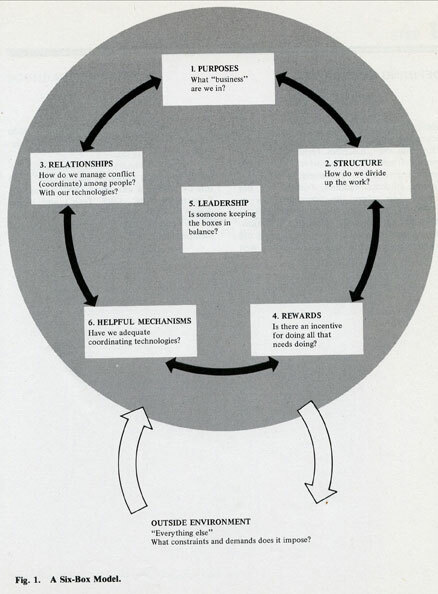 *Based on Marvin R. Weisbord, “Organizational Diagnosis: Six Places to Look for Trouble with or without a Theory,” Group & Organization Studies 1, 4 (December 1976): 430-447.